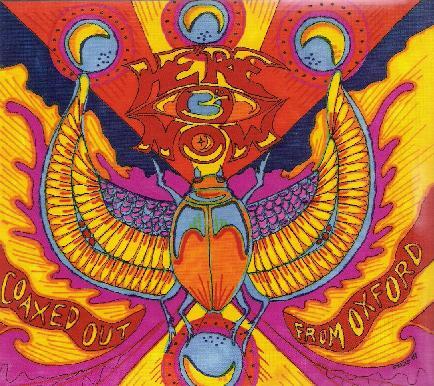 Here & Now - "Coaxed Out From Oxford"
Coaxed Out From Oxford was originally released on cassette in 1983, and is a Here & Now release I'd previously been unaware of. Dave Weller at 4 Zero Records has recently released a remastered version of this live performance, recorded live at Oxford's Cowley Centre on October 14, 1983, with three bonus tracks recorded live at the Polytechnic of Wales on March 7, 1984. The band at these shows consisted of Deano Ferrari on guitar & vocals (the more than capable successor to Steffi Sharpstrings), Gavin Da Blitz on keyboards & vocals, Keith Th'Bass on bass & vocals and Paul 'Baby Face' Rose on drums. Songs like "Ways To Be Free", "Heartbeat" and "Fantasy Shift" feature classic Reggae infused space rock that so many of the great British festie bands adopted in the 1980s. Other highlights include "Heart of the City", a fun song that rocks hard, and has a cool combination of new wavey keyboards and ripping space guitar. "Theatre" is similar, incorporating elements of new wave, ska, and space rock. At nearly 10 minutes "Secrets" is the longest track of the set and is one of the most purely space rock. The guitar, synths and song style are deep in Gong territory, and it's got a great mixture of song and rocking instrumental space exploration. Absolutely fantastic. Also deep in space is an excellent renditions of Gong's "Opium for the People". Among the other tracks I enjoyed are "The Mega Number" and "Glad You're Here", both of which blend festie psych, a bouncy Reggae-ish groove, and a whimsical punky vibe. And "Salvador" is a rollicking song with a ska type vibe. Like Madness gone festie-psych. Then there are the three bonus tracks, which hint that this performance may have been a bit different from the Oxford's Cowley show the year before. "Last Chance" is a laid back Gong-ish song that rocks out but has an overall mellow vibe. There's a cool cover of Daevid Allen's "Stoned Innocent Frankenstein". And "Jimmy Mac" is a hell of a closing track, and along with "Secrets" is among my favorites of the set. It's a rip roaring space rock instrumental, but with a bit of a prog rock edge. Really outstanding. I'd love to hear the entire set from this show. In summary, an outstanding set and I'm tickled to hear this live Here & Now from so many years ago. There's also a little booklet with musings from Keith Th'Bass and pictures. Big kudos to Dave Weller for making this available. Dave started his 4 Zero label a couple years ago to release some archival music from the San Franciscan band Mushroom, and has since released a second Mushroom set. He's on a real roll with this Here & Now release. For more information you can visit the Here & Now Myspace site at: http://www.myspace.com/herenowplanetgong. There's also an excellent Here & Now site at: http://www.herenow.be. Visit the 4 Zero Records web site at: http://www.4zerorecords.co.uk.